We live in a day and age where having a smartphone is more or less a compulsory device to own, and a tablet is a bonus. The thing is, you would need to keep those gadgets juiced up every day in order to maximize their use, and while I am quite sure that most of us do charge up our smartphones and tablets each night, there are moments when our memory fails us, and we end up at work with a smartphone which is on its last legs where its battery level is concerned. 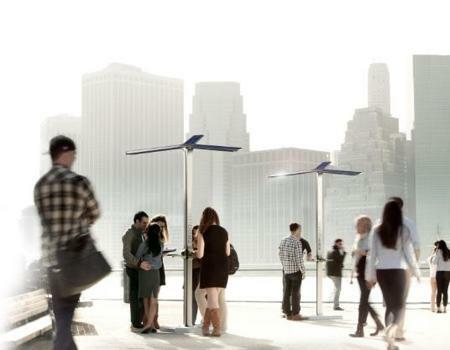 If you are a New Yorker, happy days are here, especially with word that solar power market leader Goal Zero working alongside AT&T and Brooklyn design studio PENSA, to roll out an environmentally friendly solution to charging woes by offering public solar powered charging stations that they have called Street Charge. Street Charge would arrive in a striking and modern design, where it will be powered by the latest in solar panel and battery technology from Goal Zero. Folks can conveniently juice up their handsets as well as other handheld, thanks to the integrated USB ports and charging tips. The solar panels as well as lithium batteries have been elegantly incorporated into individual stations to make sure that there is always enough energy to power up a thirsty device, regardless of whether the sun is beating down on New Yorkers unrelentingly, or when the moon is full. The prototype was first tested in Brooklyn last summer, and it looks set to kick off something big and new in the near future.